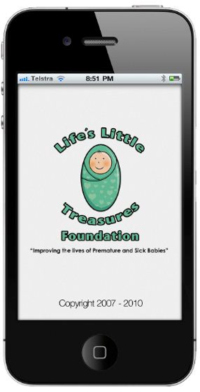 I have recently learned about this fantastic app created by Life's Little Treasures, an Australian premature baby charity. I have to say I am very much a newcomer to the world of smartphones, having only acquired one recently. It amazes me how much information you can have at your fingertips. I wish I had had one when Joseph was in hospital. Mine very cleverly instantly uploads all my photos and video to Google+ which saves me loads of time, this alone would have been wonderful. One of the hardest things about NICU is the terminology, and the numbers, lots of numbers, and keeping track of information when you are under immense stress is not easy. Grams of weight gain, mils of milk intake, oxygen saturations, it is dizzying. Carrying a notebook and pen became essential for me, but how great it is to have a neat electronic way of recording the numbers and seeing your baby's progress. And of course, you have that information in the years to come as well. I often now wish I had a better record of Joseph's time in hospital, especially as people as me questions, and over the passage of time I have forgotten some of the detail. Currently the app is available for iPhone users and plans are in progress for an Android version. The application costs a very small amount, less than £3. There is also a free app available of NICU words, which would prove invaluable I am sure, to any person thrust into the world of NICU. This news article from Channel 7 shows the app in action. Cool, I looked for a decent app when I was in the NICU and couldn't find one. But this one sounds pretty cool. In my case it should have had a section that said 'questions to ask on doctors round' - ideally with a sub section where I could tally the number of times I'd asked the same question and possibly a further sub section where I could award points to the doctors on the basis of their positivity. A really clever app would calculate their scores and high light to me who were the best ones to ask questions to. But maybe I'm asking too much! Having said that, one-day hubby is a software developer, so perhaps I could ask him to whip me up a quick app (as if it could ever be that simple!) is there anything else you would have on it kylie? What about head positioning? See I think that's important, and this is an aspect of our babies care that I see no reason why parents can't take a lead on really.,,several times I came in to the NICU and thought, she's facing the window again? Reaaaally? That looks a great idea,I have Android so can't look. I didn't get my smartphone until gemma was 6 months but this would have been great. Head positioning would be a good idea as a lot of nurses didn't do it," she rolls back.when I move her". I know but wedge her in at least for a while, once I realised how important it was I would do it myself and also once I was comfortable moving her and turning her over! A record of answer to questions I had asked and info I was given as I would tell graham at night but it was never "medical" enough for him! That would have helped keep a record. I really wish I had kept a diary,it was suggested,but I was too busy and caught up. You think you won't forget the detail but nearly 2 years on I have. a fantastic idea :) As an ex prem almost 30 years ago, i think my mum would of found this helpful perhaps even useful, 28years ago. although she never kept a journal or any notes of any kind so i just rely on her (not so great) memory- because she was just too busy. she travelled half an hour daily twice day if not 3times daily to visit me but never thought to keep a journal. the scbu staff(it was a scbu rather than nicu) had only ever had babie born 31+ weeks so they went home within days and weeks- rather than the eons of months later that i did- never thought to keep journals. i do however have little pieces of paper with kids (from the paeds ward) writing on with messages to my parents supposedly "from me" that the staff made during the times my mum n dad weren't there. i still have the weight gain graph with days and kg on. and mittens that were knitted for me. she called the express machine "daisy" and back then i imagine they were huge encumberous things that werent the most portable of items(1980s here). for a long time the milk was just kept in the fridge as i couldnt tolerate it and they even ended up giving some to a downs baby that was abondaned in scbu by its mum:(. how attitudes have changed. i had unwanted fame, unfortunately due to my gestation, which was almost unheard of in 1984.